Saturday, January 31: Ojibway's winter birding trip along the Detroit River today recorded 41 species of birds. Highlights included an adult Black-crowned Nigt-Heron at Lakeview Marina, three Great Blue Herons and a female Belted Kingfisher along Little River and 21 Pine Siskins at the nature centre feeders. Karen Cedar and the Ojibway hiking group saw four Bald Eagles on the Detroit River while walking over by Black Oak Heritage Park on January 26. Tuesday, January 20: A Hermit Thrush has been hanging around the nature centre for several days. The nature centre is covered in Virginia Creeper vines and the thrush is feeding on the berries. A flock of four American Robins were also seen today feeding on sumac berries next to the parking lot. Saturday, January 17: Ojibway's field trip to Point Pelee today was rewarded with a good variety of winter birds despite the chilly weather (-14C). The Spotted Towhee was present next to the tip washrooms and afforded eveyone an excellent look. Northern Harriers and Rough-legged Hawks were frequently seen overhead. The latter were noted in both light and dark phase plumages. 49 Wild Turkeys were seen feeding along the roadside between Dunes and Sleepy Hollow Picnic Areas. Lunch was provided at Janet Tuite's home where over 200 American Goldfinches, Common Redpolls and Pine Siskins were present at the niger feeders. Monday, January 12: Winter finches are suddenly showing up across the county. Pine Siskins have been reported at many feeders (fide Dan Loncke, Tom Hince, Paul Pratt), including the nature centre. They are visitng niger feeders along with American Goldfinches. Common Redpolls are less numerous and one was at the nature centre feeders on January 10. 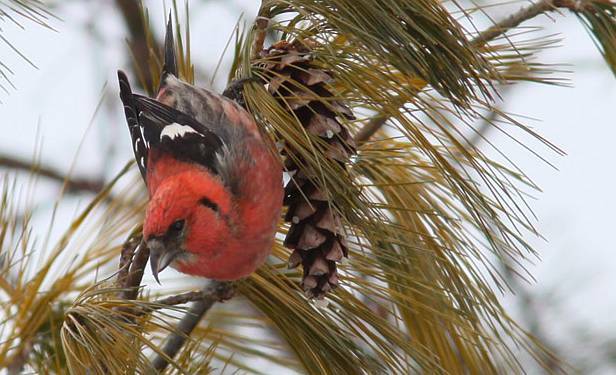 White-winged Crossbills appeared in the pine/spruce plantation at Holiday Beach Conservation Area. A few dozen were seen January 8 (Tom Preney, Russ Jones) and this increased to over 350 by January 11 (fide Tom Hurst). Over 100 were reported there this morning. Thursday, January 01: Here are the results from the Ontario portion of the Detroit River Christmas Bird Count. Canada Goose 107, Mute Swan 26, Tundra Swan 3, Mallard 23, Redhead 5, Greater Scaup 1, Bufflehead 4, Common Goldeneye 15, Hooded Merganser 3, Common Merganser 34, Ring-necked Pheasant 1, Wild Turkey 2, Great Blue Heron 4, Bald Eagle 2 adults, 1 immat., Sharp-shinned Hawk 1, Cooper's Hawk 6, Red-tailed Hawk 6, American Kestrel 6, Ring-billed Gull 3, Herring Gull 35, Great Black-backed Gull 1, Rock Dove 286, Mourning Dove 129, E Screech-Owl 4, Great Horned Owl 1, Red-bellied Woodpecker 22, Downy Woodpecker 66, Hairy Woodpecker 2, Northern Flicker 5, Blue Jay 106, American Crow 6, Black-capped Chickadee 91, Tufted Titmouse 12, White-breasted Nuthatch 20, Brown Creeper 2, Carolina Wren 15, Eastern Bluebird 11, Hermit Thrush 1, American Robin 5, European Starling 407, Cedar Waxwing 37, American Tree Sparrow 257, Fox Sparrow CW, Song Sparrow 9, Swamp Sparrow 4, White-throated Sparrow 11, White-crowned Sparrow 8, Dark-eyed Junco 292, "Oregon Junco" 1, Northern Cardinal 119, Red-winged Blackbird 61, Common Grackle 5, Brown-headed Cowbird 39, House Finch 89, Pine Siskin 2, American Goldfinch 92, House Sparrow 321. Participants included Karen Cedar, Rowan Deneau, Larry Evon, Kristen Fawdry, JoAnn Grondin, Shirley Grondin, Kathy Lesperance, Dan Loncke, JP Marentette, Mary Montsch, Anne Muir, Ron Muir, Paul Pratt, and Bonnie Ross.